The idea of this product is to create a grid expert Advisor that would not lose like other grid expert advisors. 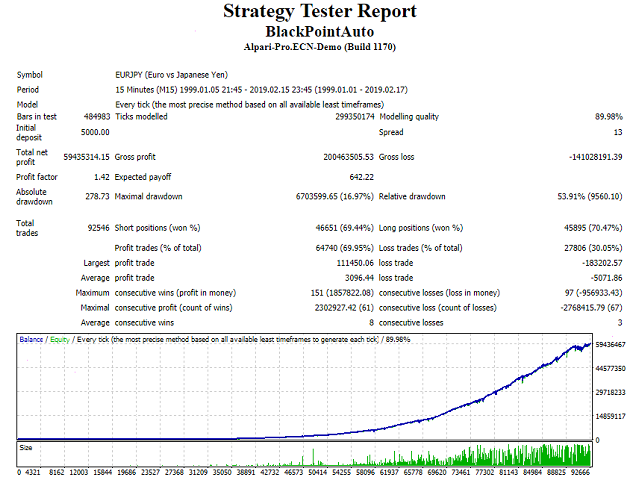 To do this, are used 100 virtual strategies with their parameters, their balance and virtual positions. If expert lose one strategy, we get 1% loss (if Risk=5000,VirtualStopBalance=5000), which can be distributed to other strategies of this symbol, as well as to other advisors involved in global recovery with one common variable. 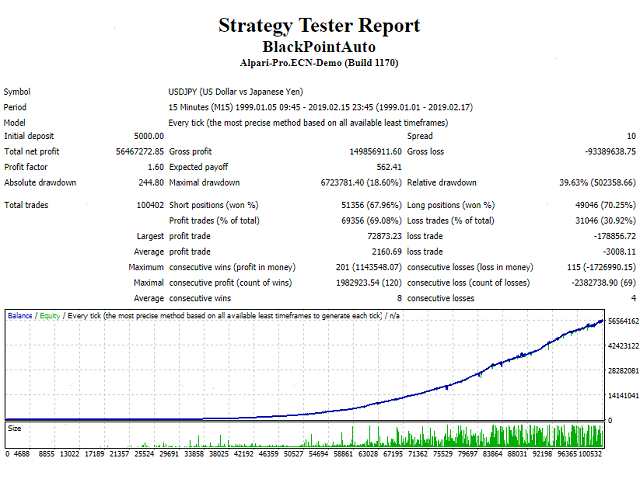 The expert Advisor was created using GeneratorPro. The peculiarity of this expert Advisor is the way it was optimized. A step is made to identify the rank of the best parameters suitable for the pair (for this genetic optimization is done in the strategy tester), for the period 1999-2019. After that, the best 100 sets of parameters are identified from the obtained rank of strategies, using the Create module and random sampling mode. When using the global recovery system 2019 (which is compatible with other products: GeneratorPro, Combination, HotPointAuto, GreenPointAuto), the distribution of losses will occur. If one pair is used, the loss is distributed within 100 strategies, if N pairs are used, the loss is distributed within N*100 strategies. If other expert advisors with this function are used additionally, the distribution will be between all virtual strategies. Algorithm of virtual strategy: opening the first position with the trend after the correction. If the price goes not in our direction, then we average. If you exceed the limit, it is not averaged. If the position receives a signal to turn, then reverse the position with the coefficient of reduction of all lots. If the price goes beyond the set corridor, the position is closed and will be opened when a new signal occurs. The algorithm also has a parameter limiting the reversal in the flat. Deposit from $ 1000 or equivalent. It has a built-in system for saving calculations and parameters to files. There is a system of error control with feedback. Close And Remember Before the Weekend - close, and to memorize the positions before the weekend. - Now it is possible to change strategies without restart. 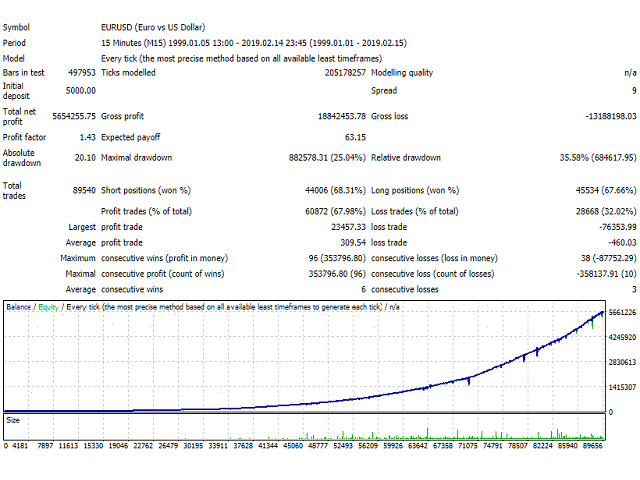 - In AUTO mode for EURUSD and EURJPY are selected EURUSDv2, EURJPYv2 strategy. Check after upgrade. If you want to leave the previous ones, choose EURUSD or EURJPY strategy. 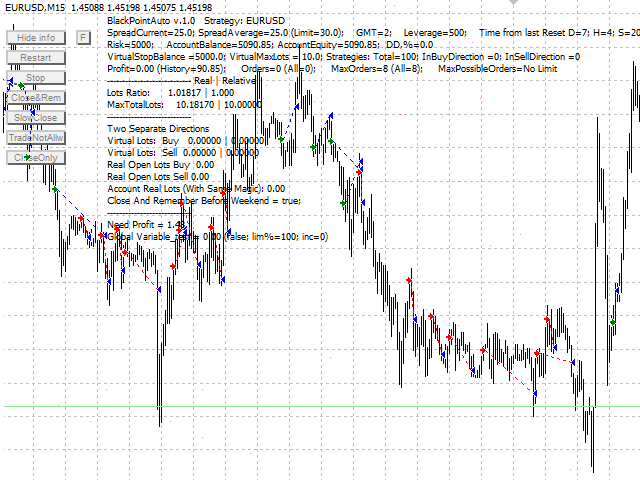 1) Added strategy USDCAD for M15.